It is difficult but inevitable to bid goodbye at several instances of life. 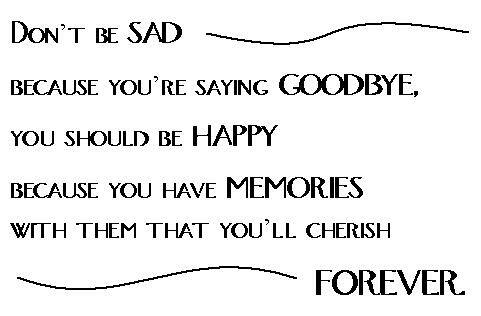 There are so many types of goodbyes – Short term & Long term, Personal & Professional. But, life is a journey and we have to keep moving…keep exploring new paths… keep enjoying new environment…keep switching to next phase of life…& keep focusing towards the next destination. Attachments & associations are good but changes are also essential. Anything that is stagnant is lifeless. So, if you have to be lively, you have to be ready for new changes & challenges. If you find it difficult to move to a new home/city/school/office, to leave home & go to hostel/job, to leave school & move to college, to leave your parent’s home & move to your spouse’s place, then this blog post is for you. Above instances are faced by almost all of us & they are so necessary for our personal & professional growth that we should learn to cope up with such situations wisely. If we talk about personal relations- Family & Friends, they never fade with distances. And with the technology today there is no bar for staying updated and be in touch. Now, talking on professional front, moving from school to college and then to job is also essential for your own growth & development. Life is so full of experiences & every change teaches us something, so one should always be ready to welcome these changes with full zeal & enthusiasm. Now, the above does not means that one shall be immediately ready to move away from family or to switch jobs or to relocate from one place to another. Also, some changes are implied on us by nature & by circumstances and are not in our control but there are some for which we are free to make a choice. They need your own introspection, evaluation of your circumstances, your priorities & your goals. You then need to explore all pros & cons & go ahead making a wise judgment. The only point of caution is once you make a choice; do not go into cycles of thinking & re-thinking. Make a firm decision & thereafter never ever give a second thought as it may confuse / disturb you. “Waters from many rivers continually flow into the ocean but the ocean never overfills. It is human nature to be dissatisfied with what we have & to strive for what we don’t. But, nothing is this world is perfect. Yet, we always strive for perfection and the definition of perfection may vary from person to person. We all keep looking for a change in search of this perfection. Every experience has blend of sweet and bitter memories. People generally pick one of them while bidding goodbye i.e., they only think of bitter , difficult moments & feel contended enough to get rid of them or they only remember the sweet & good part & feel bad for leaving those cherishable times. Even bitter experiences are good for us. They are a blessing in disguise. They teach us to struggle, they prepare us to face difficult times, and they caution us and give us a vision and understanding of good and bad. They make us strong & tough. Now, talking about sweet, cherishable moments, good & happy times. It becomes so difficult to justify & prepare oneself for leaving such a place. But, in such a case just ask yourself is that place so heavenly & so attractive that you can spend a lifetime there? Will your choice of staying back at a single place not affect your personal or professional growth? Or, is it worthy enough that you are ready to sacrifice anything for it? Will it keep you satisfied always? And, in your answers lies your decision. If all of the above is “YES”, there is no need to say goodbye at all. But, if even one answer is “NO”, it’s time for a change, time to explore something new, time to start a new beginning & a new journey. And instead of comparing new with old, fearing of what lies ahead, re-thinking on decision and dwelling in past, one shall focus on the positive points & welcome the change. Always, have trust & belief in yourself. Shed-off all the fear and anxieties related to new world. It’s always good to be with new people, at new places, in new environment as they help us learn & grow, shows us different outlooks of life, helps us understand people & circumstances better. So, friends I would just like to conclude by saying that “Goodbye’s” will always be there but “Welcomes” will also follow. Good memories & good friends will be the treasure that you take along with you and there will be many more treasures that await you. Always leave with a happy smile & a cheerful Goodbye. This entry was posted in Memories and tagged FAITH, family, friends, GOODBYE, Journey, Life, moments, People, Quotes, Random, Relationships, Thoughts, trust, welcome by Akanksha. Bookmark the permalink. Akanksha – where are you going? What will you be doing? So many questions when someone announces goodbye. I’m not sure if this post is your reflection of goodbyes or if you’re leaving your site and writing. Hello Pat… Thanks for the concern.. I know it is hard to say goodbye, especially with good friends. Don’t know why change is so difficult for us sometimes. Though it was hard to say goodbye to your friend I’m happy to hear you’re still with us on your blog. Its my pleasure to be here…to share my views with you all and to read your opinions & develop myself.